Located in the heart of Soho on Poland Street, Social Eating House was the third restaurant in the portfolio of celebrated Michelin starred chef Jason Atherton, once a protégé of Gordon Ramsay. Set over three floors with a basement chef’s table, a group floor restaurant and a top floor bar, Social Eating House offers a contemporary bistro menu and currently holds one Michelin star. I loved Jason Atherton’s food when he was still cooking under Gordon Ramsay at Maze, before he got financing and expanded internationally. His restaurants can now be found not only in London, but also in Asia, New York and as far afield as Sydney. It’s not easy to maintain high standards when chefs expand so rapidly. Too often I find that with such expansion the food develops a formulaic feel to it and lacks the sense of heart and substance that won the chef his accolades in the first place. We went to Social Eating House and dined on the special prix-fix menu which was priced at £29.50 for 2 courses and a cocktail or £34.50 for 3 courses. The vibe was informal and quite buzzy, with a fun and funky energy. It was all very nice if a little too noisy. We found the experience to be acceptable relative to the price we paid, but didn’t find it particularly special for a Michelin starred restaurant. Sure we only had the prix-fix menu, but we hadn’t expected to find errors in the food. 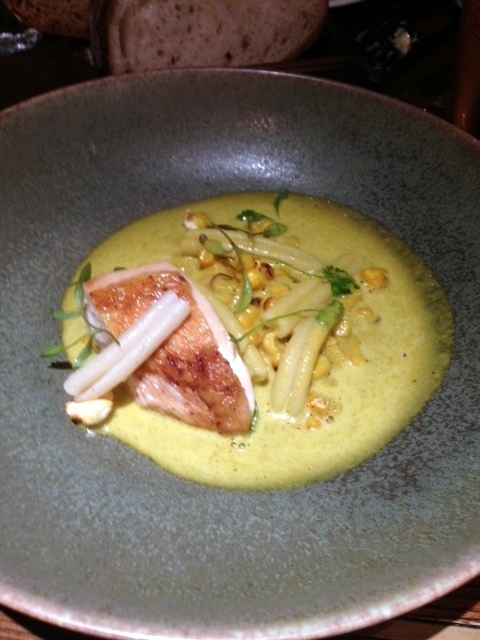 Starter number one was the Normandy chicken with BBQ sweet corn, popcorn, strozzapreti pasta and laksa sauce. The chicken was pleasantly cooked, but the sauce was quite strong which ended up overpowering the chicken. There was also quite a lot of the sauce which didn’t help matters. Moreover the sauce hadn’t been heated up properly and so was slightly cold. I didn’t much like the popcorn in the dish either – it did not taste as it had been freshly popped. However the pasta was lovely. 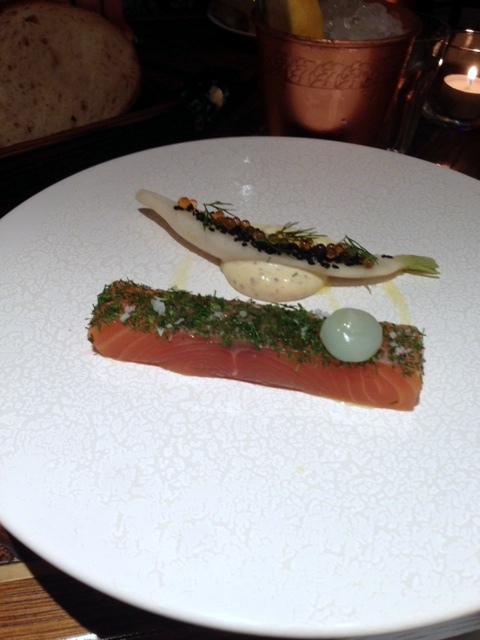 Scottish salmon gravadlax with sweet grain mustard, young mooli and dill was a prettily presented dish. The salmon was fresh and tasted fragrant with the dill. It was a pleasant dish but not particularly inspiring. Pork collar, Arlington white egg and capers turned out to be a variation of a veal Holstein, but using pork instead of veal. 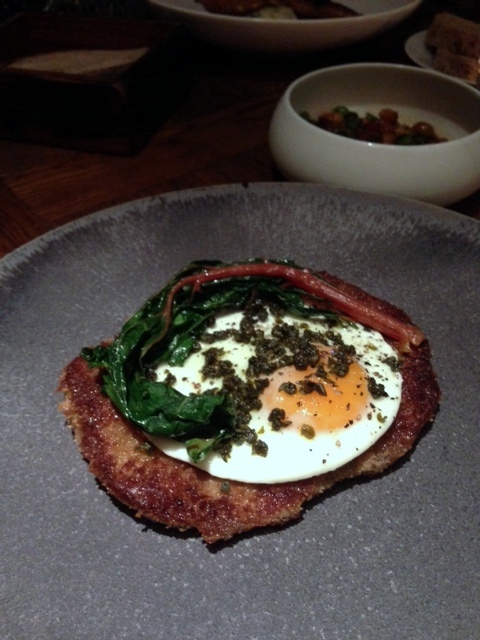 The pork collar was well made and tasty with the brown nut butter, egg and capers. But the highlight of the evening was the side dish of coco beans, peas, broad beans and chorizo. It was delicious primarily because the chorizo in the dish was so good. South coast skate was well cooked, and there was lots of freshness coming through from the accompaniments of ras el hanout and green olive écrasé. Confit lemon added acidity to the dish which provided an interesting contrast, even if it was a touch sharp. 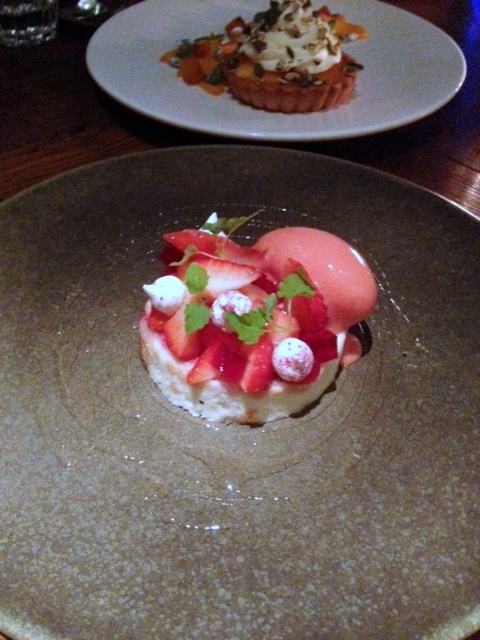 Both desserts were expertly presented, and I really enjoyed the strawberry arctic roll with strawberry sorbet. The artic roll married really nicely with the sharp, tangy sweetness of the sorbet. It was a really refreshing dessert. 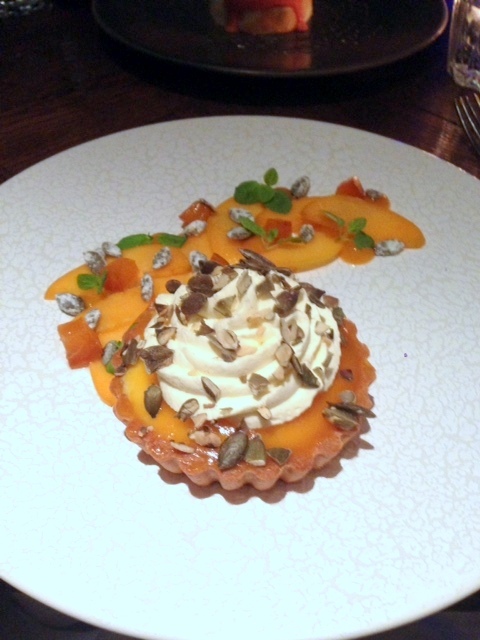 In contrast, the crème fraîche tart with rum Chantilly and apricot was a little bland. As for the pastry, this was tasty but had been overcooked as it was quite hard. The cooking was good enough to make me not regret the money I spent. But it wasn’t good enough to make me want to come back to try the full a la carte menu. I’m sure Social Eating House has its share of fans because it has an engaging vibe, but I personally couldn’t understand the Michelin rating. As for the service, this was less than smooth. Our waitress was very pre-occupied – probably with a personal issue – and so things didn’t run as it should have. 1) The side dish of coco beans, peas, broad beans and chorizo in the pork collar dish. 2) The Normandy chicken dish. 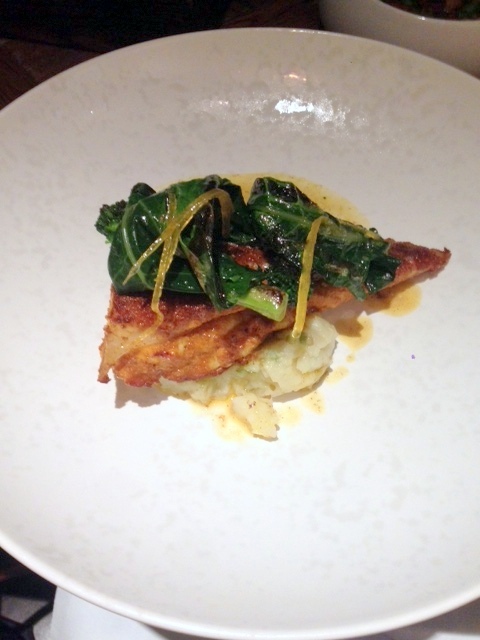 Price: The prix fix menu is £29.50 for 2 courses and a cocktail or £34.50 for 3 courses, excludes drinks and service. I love your reviews so much. I especially value your honesty. So many bloggers only write positive reviews because the restaurant is paying for their meal. It is therefore so refreshing and valuable to read your reviews which actually help me to decide whether a restaurant might suit me or not. Thank you! thank you for leaving such a gracious, generous comment. I am really delighted you enjoy my reviews.